Experience a slice of traditional Sami life on this 2-hour tour from Saariselkä, including a reindeer sleigh ride. Visit a reindeer farm, meet the friendly herders, and enjoy an unforgettable sleigh ride through the countryside, with only the jingle of reindeer bells to break the silence. 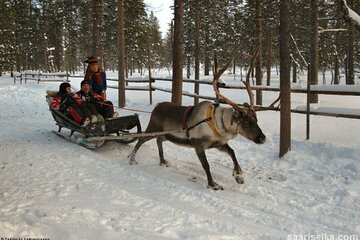 As you travel, admire the frozen landscapes, and try driving the reindeer with the help of your herder-guide. Afterward, head inside the herders’ cottage or cozy 'kota' tent and hear interesting stories about reindeer care and herding over a reviving coffee or tea.